Why filling every moment of your attention is sapping your creativity, your ability to concentrate and your enjoyment of life. Something I realised I was doing wrong in 2018, aside from peeling bananas, was filling every moment of time with doing something. Whether it was listening to a podcast when walking back from the gym, playing Angry Birds while on the subway, or having Netflix on in the background while I colour my comic strip, I never had a single moment of silence, much less boredom. The second rule is to “embrace boredom.” The broader point here is that the ability to concentrate is a skill that you have to train if you expect to do it well. A simple way to get started training this ability is to frequently expose yourself to boredom. If you instead always whip out your phone and bathe yourself in novel stimuli at the slightest hint of boredom, your brain will build a Pavlovian connection between boredom and stimuli, which means that when it comes time to think deeply about something (a boring task, at least in the sense that it lacks moment-to-moment novelty), your brain won’t tolerate it. Late in the year, I realised that 90% of my waking hours were spent with Bluetooth earbuds in, listening to podcasts, Instapaper articles or music and 10% was allowed for my brain to catch up on all of that information. The only time allowed to process it and make any sense of that enormous amount of input was during sleep — which, as you can imagine, was pretty restless. I reinstated my daily practice of meditation which made a massive difference. It made me more mindful of my tendency to reach for my phone or fill some dead time with something. The reality is: boredom is important. It allows your mind to wander and make connections it mightn’t have had the opportunity to while you were listening to another episode of the Tim Ferris podcast. Creativity requires quiet. Part of the reason you get your best ideas in the shower is that you don’t have any other input — and your subconscious is on autopilot with something you’ve done routinely for decades — leaving you with the ability to make creative connections and come up with great ideas you might have missed out on having if you plugged up that time with further input. Take out your earbuds. Just walk. Don’t take a book. Just sit. Put it back. Don’t take babies. I now carve out entire blocks of time with nothing in them on purpose. It was an experiment I tried in 2018 and the results were astounding. The space I carved out yielded more creativity than anything I could have activelyscheduled in those blocks of time. I would implore any creatives to try it and see what comes of making time for nothing. Funny story! I got the ‘ok’ on this one while I was on set of Doodle Wars this past June. I was sitting around between takes with Hilary F. Campbell and, tired as hell, we both filled the time drawing to stay awake. I inked it in on my sketchbook before getting called away to finish the show. After it had sat in the drawer at the New Yorker for the Summer (In comedy, timing is everything… same with publishing cartoons!) I decided I might switch the gag around and re-send the artwork to use when Fall decided to snap into place. You can hear Scott and I coming up with this one in an earlier episode of Is There Something in This? A weekly podcast where we come up with New Yorker cartoons. Available wherever you subscribe to pods. I've been commissioned to draw caricatures of people since my teacher asked me to draw the school gardener. It was a terrible caricature, but he gave me 20 bucks and it seemed like a crime that I could get paid for something I love doing. 20 years on, the only thing I love more than drawing caricatures of gardeners is watching Larry David do literally anything. It was with immense anxiety, then, that I accepted the most intimidating commission of my life. I can't quite explain why, but being insulted by Larry is a great honour. For a comedian, it's like being blessed by the Pope. "Larry David's Broadway show is a hit. 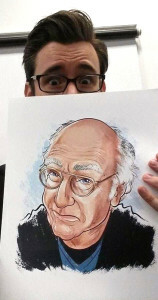 Katie Couric wants you to draw a caricature of Larry David for the wall at Sardi's so she can present it to him at the restaurant, live on her show. We need it hand-delivered in 2 days." There isn't enough Valium in the world to take that in without forgetting how to breathe. 1. This is for Katie Couric's show on Yahoo! watched by millions. 2. Getting asked to draw a caricature of anyone for the wall at Sardi's is insane. Steckley passed the job on to me knowing full well I'm a cartoonist and a comedian, and a huge LD fan. This job was the perfect storm. You're going to have to pardon the hyperbolic fanboy drool. I generally feel the idolizing of anyone -comedian or otherwise- isn't always the healthiest of life choices, but let me just say, Larry is the exception that proves the rule. One of the best dates I ever had was when the girl suggested we put on Season 6 of Curb before we ended up making out on the couch. To this day I can't tell you which part I enjoyed more. Curb Your Enthusiasm is the only show I've ever watched on rotation constantly for over a decade without ever tiring of it. I love it more than Seinfeld. I know more of the idiotic minutiae of the Larry universe than I know about my own medical records. I snapped up the last tickets to the first night of previews of his new show, Fish in the Dark and took an old friend of Larry's as my man-date. Without a hint of fanboy bias, I canhonestly say it was the funniest, best-written comedy I’ve ever seen. No bells and whistles, just great writing and brilliant performance. It was basically one giant episode of Curb Your Enthusiasm with a theatre treatment. The moment he broke into an epic “Prett-aaaaaay Prett-aaaay Prettay good” was an incredible roar of excited laughter I’ve never heard from a theatre audience. In previews it had a couple of kinks, but nothing fatal. Seeing LD in the flesh is incredible. He moves like a 30 year old. It’s baffling. I can’t compare the show to anything. It’s a singular piece of art, and I’m insanely lucky to have seen it in its infancy. It has broken box office records, and it is now, unfortunately, impossible to get tickets. "Mr. Sardi ran one of the world’s most famous restaurants, a Broadway institution as central to the life of the theater as actors, agents and critics. It was, the press agent Richard Maney once wrote, “the club, mess hall, lounge, post office, saloon and marketplace of the people of the theater. 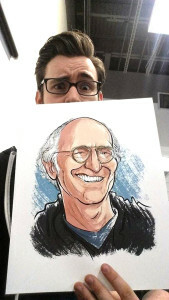 I've had a caricature of Larry framed and hanging above my desk for years. It was painted for me by a far more talented artist and to this day, I feel like a fraud of an artist every time I look at it. It captures him perfectly -and it's a way better caricature than the work I produced for this commission. Needs to look 'less' like him for Sardis. I really agonised over this caricature. I was meant to catch up with Ed for beers and had to cancel. Such a was the importance of this job. I didn't sleep for three days. I started out drawing roughs from every reference photo I could get my hands on. Larry's a devotée of Woody Allen, and every official portrait of Allen has his head being propped up by his hand. 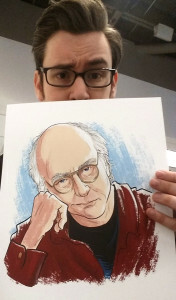 The first season of Curb had this image of Larry as the promo photo, so I worked with this as a starting point. The problem is, of course, that was from 1998. Larry doesn't look quite the same as he did back then, and the photo doesn't really capture his essence much these days. That, and the caricature itself wasn't very good. We scrapped that version and moved on to version 2. The producer sent back a few reference photos, insisting we do one of Larry smiling. Larry's not really known for being a big smiler. He has a smirk he wears when he's stirring people up, being a social assassin, but he's not a big smiler overall. The smiling version wasn't my favourite, but the producer and Katie's team liked it. I wasn't thrilled with it. Dozens of frantic, sleep-deprived emails flew back and forth over the two days of drafts, changes, amended amendments. I was throwing everything into this. I was sending roughs to trusted friends to get feedback on likenesses and styles. Finally, the producer said they really wanted to go with this reference photo of Larry (which hilariously was the identical reference photo for the caricature I have above my desk) so I was to work from that one for the final caricature. I was also to make it more of a portrait, not so much an exaggerated caricature. At this stage, I just wanted to get it out- I'd been agonising over this thing for days and I'd grown a full beard. I jumped on the subway and headed uptown, sleep-deprived and clutching on to my scribbles for dear life. I handed in the final version in to the producer to get framed. They used in the shoot that weekend. I wasn't happy with the finished product, but I'm that way with literally everything I've ever drawn. All I ever see is the errors- the flaws, the ways it could have been way better, but the deadline was tight, and so was my chest by this stage. I slept for 14 hours the next day. The producer did a fantastic job- The final interview is brilliant. The reaction to the caricature is exactly what I anticipated. I love that he hated it. I now have a copy of the caricature for my studio, signed by Larry. Want a caricature of your own? Click here to enquire. Not since M*A*S*H* has an entire generation enjoyed a host of characters as genuinely funny as the people of Springfield. The Simpsons happens to be the longest running sitcom in history and one of the most quoted television shows to boot. It can't be understated enough how difficult it is to keep a weekly show -not just a cartoon that has to be animated- but a prime time comedy show going for 25 consecutive seasons across more than two decades, and still be successful. A lot of people will tell you The Simpsons 'lost it's mojo' in the early-to-mid 2000's for whatever personal reason, and they stopped watching. I can say with some sincerity, whatever they thought was lost, is back now. The Simpsons is funny, and it's better than ever. I couldn't be more enamoured of an internationally syndicated comedic, satirical cartoon show that captures the zeitgeist of each decade each episode was written in. The whole shebang is an incredibly difficult thing to pull off, and with incredible consistency the writing and production team have done it so well. I had the great pleasure of meeting one of The Simpsons' great Directors, David Silverman. Name one of your all-time favourite episodes you can remember and the odds are, he directed it. David also took on the immense task of Directing the Simpsons Movie. I couldn't begin to imagine the scale of what he and the team at Fox had to work with, on top of putting out a new episode of the Simpsons every week. We had a day to kill together after the NCS Reuben Awards weekend in Boston in 2011, so we walked around the city on foot. One of the great things about talking to David about the show is the passion he has for animation, and for cartooning in general. You can't work in the industry for as long as he has without loving every aspect of the process and its origins. He showed me classic Pogo strips and the artwork and odd vernacular in the old comics. 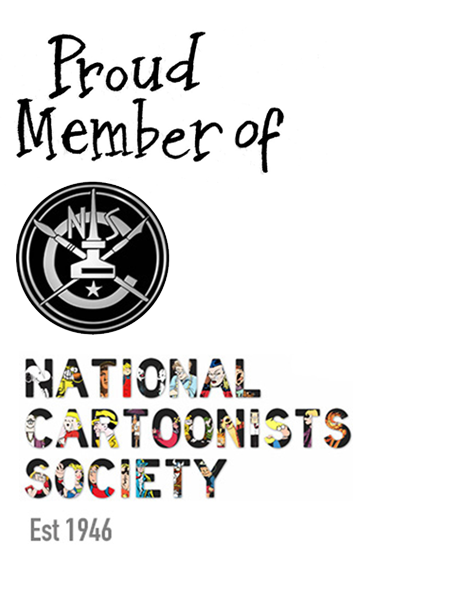 Every minute with cartoonists like David is a huge and invaluable lesson for young cartoonists, and I couldn't recommend coming to the Reubens and joining the National Cartoonists' Society enough for any working or up-and-coming cartoonist. If you're in Australia, the ACA is just as great a resource. I think the biggest thing that strikes me about why the Simpsons work is the writing. Some of the best writers in television comedy have worked on the show, and many still do. It's become something of an institution, like the Tonight Show. If you want a glimpse into the mind of one of the Simpsons longest-contributing writers, take a look at Tom Gammill's Comic Strip on GoComics, The Doozies. Lord knows he doesn't promote it enough. It is with a heavy heart that I report today the passing of a true great in the comics industry and someone I had the great privilege of calling a friend. Stan Goldberg passed away today from complications of a severe stroke he suffered in August. He was 82. Stan Goldberg was best known for his with as the artist behind Archie for nearly 40 years. He was the kind of guy that makes you hopeful as a cartoonist; someone you could aspire to be like in your career, particularly your later years. Stan still had such great fervor for what he did in his 80's as much as he did in his heyday. At 82, he was still churning out beautiful pages of artwork from his very simple desk setup right up until his stroke. He and Pauline spent most of this last summer out at their beach house. He'd created an amazing piece of art for the upcoming Box Art Auction benefiting East End Hospice. Stan had the kind of career in comics that in some ways flew under the radar, but in others was one of rare influence and greatly respected by industry pros. He was best known as a principal artist for Archie Comics for over 30 years, but he also freelanced for many others. He worked for Timely Comics, which would become Atlas and then Marvel, and was the colorist for their early titles, coming up with many of the color schemes for the costumes for The Fantastic Four, Spider-Man, The Hulk and other eventual staples of the Marvel superhero world. After a split with Archie, Stan continued to work for companies like Bongo, DC and others on a variety of titles. The last few years at the NCS Reuben Awards were special ones for Stan and Pauline. In 2012 in Las Vegas, the NCS honored him with the “Gold Key” award, inducting him into the NCS Hall of Fame. A very humble man, Stan was really moved by the recognition, but it was undeniably well-deserved. You should know you are a big deal in the world of comics when Stan Lee sends in a long video tribute to you for your award presentation! It was wonderful to see him get that award. This past year was another special Reubens for the Goldbergs. Back in October of last year, Stan and Pauline were involved in a terrible car accident that badly injured them both. I was told that one of the first things they said after beginning their long roads to recovery was that they were determined to get better and go to the Reubens in San Diego that following May. In fact, they had their room booked right after the accident as incentive. At the Reuben Awards dinner we recognized them and let them know how glad we were they were there and how important they are to the NCS family with a thunderous round of applause. They are such special people. Little did we know we were also saying goodbye to Stan. Stan was one of the most generous and encouraging cartoonists I ever had the privilege to meet -not to mention one of the most impressive. My first encounter with Stan was in 2006 when I was 21. Stan and I were guests of Bunny Hoest for her annual "Bunny Bash" in Long Island. I was a bit starstruck at first, a dorky kid who'd flown over from Perth, but Stan's softly-spoken, gentle manner soon calmed my nerves. His wife, Pauline is just as polite and warm. I had a long chat with both Stan and Pauline that afternoon and kept in touch from then on. Eight years later I'm living in New York, thanks in no small part to Stan and his incredible generosity. Stan took the time to write to the US Department of Immigration as a reference for me becoming a US Resident. I got to tell Stan this story when I last saw he and Pauline in San Diego at the Reubens in May. He was tickled pink, but in his trademark modesty he wouldn't accept the praise. In 2009 on my annual trip to New York, Stan very generously took the train all the way up to the Society of Illustrators to join Adrian Sinnott and I for a very, very long lunch. It was there he finally got to talk me through his entire career from working at Marvel, right through to his work drawing Archie comics. My jaw was dropped the whole time. After hearing Stan's story, I thought the other Aussie cartoonists would be interested in hearing it. So, in 2010, I was very lucky to organise for Stan and Pauline to visit Australia as special guests at the Stanley Awards in Melbourne. It was my first as ACA President, and the first one I'd organised so I was nervous about the whole thing. It was a great success due to Stan, who proved to be such a popular guest that by the end he became an honorary Aussie and a lifelong friend of Australian cartoonists. He spoke at the conference of his incredible career working for Marvel and various other titles mentioned above. He always made time for anyone who wanted to meet and talk with him about anything, young and old. That night he presented the Cartoonist of the Year Award to David Pope. Stan's encouragement and joy for the craft was infectious, and his willingness to participate in the NCS was always so well appreciated. After months of agonising rehab, he and Pauline made it across the country to the Reubens in San Diego, where he spoke at the NCS General Meeting. After he stood up to speak, he got a round of applause from the whole room (and then again that evening!) It was a mammoth effort getting there despite their physical hurdles. He truly valued the community of cartoonists with whom he'd shared his career, and the many more who admired his work. Stan ended his nearly 40-year relationship with Archie with two three-part, alternate-future stories in Archie #600-605 (Oct. 2009 - March 2010), "Archie Marries Veronica" and "Archie Marries Betty", followed by some additional, final work including two pages of a flashback sequence in the 25-page "Love Finds Archie Andrews: Archie Loves Betty" in the comics magazine Life With Archie #1 (Sept. 2010), and the cover of, and an 11-page story in, Tales from Riverdale Digest #39 (Oct. 2010). In 2010, IDW released the 160-page hardcover collection Archie: The Best of Stan Goldberg, with a new Goldberg cover. It was a great pleasure to share the time I did with Stan over the years. He'll be very dearly missed by the many, many people who had the privilege of calling him a friend. Deepest and sincerest condolences to Pauline, Steve, Bennett, Karen, Debi, Bridget, Elliott, Benji and Ari. My grandparents were the best of mates for 68 years- Thelma and Harry Penn. (He called her 'Penny'). He had to say goodbye to her last month. Today would have been her 90th birthday. Poppy's still going strong at 94, he misses her so much. She used to read Ginger Meggs every day to see what he was up to. This strip ran in papers around the world today for them. This is your brain on FOMO. FOMO is a psychologically compulsive concern that one might miss an opportunity for social interaction, a novel experience or other satisfying event. This is especially associated with modern technologies like smartphones and social networking services. A study by some guy called Andrew Przybylski found the condition was most common in those who had unsatisfied psychological needs such as wanting to be loved and respected. So, most of us. In a society where we're bombarded with advertising imagery to make sure we're all super-insecure, it's the perfect storm for a FOMO epidemic. Get your tinfoil helmets ready, kids! I can't remember the last time I went out with friends and we didn't all have to compete for each others' attention. We're instantly pitted against the un-winnable battle of a universe of other non-present people who are potentially more interesting. Sometimes it literally takes playing the phone stack game to get us to engage like adults. I'm the guiltiest of my friends of this heinous social disease. I've done it for a long time. Ever since Facebook and Twitter became available on a handheld device, I was that guy checking it for updates. Checking out of wherever I was to be somewhere else. A scorching case of FOMO not seen by the likes of any other early adopters. Trying to hold a conversation with me while I was holding my smartphone was like trying to read bedtime stories to a hyena ripping into a squealing zebra. The amount of patience required not to punch me in the face couldn't be quantified. The lack of restraint on my part was unfathomably rude. Nomophobia (which is a thing, sadly) is the chronic, crippling fear of being out of mobile phone contact. Add a hefty dose of FOMO into that equation and you've got yourself a serious social problem infecting an entire generation. This all may sound like I'm being harsh on a seemingly harmless social faux pas, but as I've written before in 2010, social media exists on the very requirement of you obsessively needing to check back in and obsessively tap that little red circle to see how many people Liked or commented on your genius photo of a duck wearing a hat. Social media sites know exactly what they're doing. Peoples' addiction to them is no accident. Facebook has been redesigned more times than Tori Spelling's chin, but there's one thing on the user interface that has never changed- that's the little red circle with a number in it, hovering over a small light blue globe. The small indicator of how many notifications are sitting there, waiting for you to check. There's a reason they haven't changed it too - the human brain. It taps into your propensity to Akrasia and saps your willpower -and any tendency for Enkrateia with it. FOMO is mainly associated with Facebook and Instagram, which provide constant opportunity for comparison of one's status. Oddly enough, people on Facebook and Instagram don't tend to post photos or check in when they're doing nothing. They tend to image craft; posting photos of themselves doing fun things, out with friends, eating great food or having heaps of fun at a bar. With Facebook, you're getting everyone's Best Of album. Their Greatest Hits. Epic FOMO bait. Solar flare? Wipe out the internet? FOMO Anonymous? The first step is stopping the trigger. The next, ideally, is a digital diet to reset your triggers. I tried a little experiment would recommend you try if you have FOMO issues. I wanted to see if I could extricate myself from the lure of the little red dot for as long as I could. I would see how high I could get that little number before I felt the need to click it. The result? I'm four days in and I'm recognising the desire to click it every time it pops up, but guess what. I haven't been socially excluded/missed out on anything/died. I am, however, still a dork. The first part of breaking an addiction is recognising the trigger. (This is super easy if your addiction is guns.) I've still been logging on every now and then, checking on the events panel. I'm still responding to friend requests and DMs, but I haven't clicked the notification button. It's up to about 104. The idea that this is somehow heroic strikes me as more and more ridiculous as each day goes on. The link between seeing the red dot, and needing to click/extinguish it is diluting and my brain's circuitry is rerouting my attention to other things. Not to over-simplify neuroscience, but basically the habit forming pattern is trigger > action > pleasurable response. (Rinse, repeat.) The more you do it, the stronger the habit/addiction becomes (the stronger the neural pathways become). The more reliant on the dopamine drip you get from that pleasurable response, the less control you have over that addiction. It gets a lot more complicated; but them's the basics. The interesting thing is once you've clicked on the red dot, the pleasure disappears. The idea of having the red indicator with numbers in it ready to click is more pleasurable than the seconds after you've clicked it. It's the same principal of the study of why window shopping is so pleasurable; The desire to buy a thing is more pleasurable than having spent your money and bought the thing. There's a bunch more scientific research as to how Facebook makes you jealous and sad in the New York Times seemingly rehashed the same time each year. ..Sorry I just got distracted by an article about Bees. Interested in reading more about this stuff? Take a look at the neuroscience (new research) behind What Happens In Your Brain When People Like Your Facebook Status. 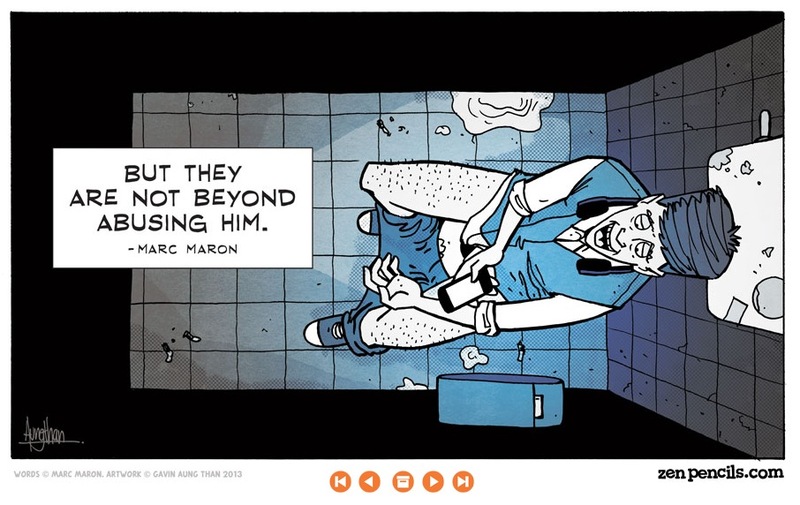 My friend here in Melbourne, Gavin Aung Than has done a great comic based on Marc Maron's bit about this. It's excellent. Click the image to view the whole thing. ONE of the most frequent questions I'm asked, aside from What's the deal with your face? is Where do your ideas come from? I write and draw a daily comic strip (6 dailies a week and a 3-deck half-page Sunday strip every week). It's written for a 40-80 year old audience and goes out to 34 countries. It gets translated into different languages at the syndicate, so it needs to be finished and sent 6 to 8 weeks in advance of being printed. I usually write 12 dailies at a time and 2 Sundays for consistency of tone and narrative. Writing one strip per day would be jarring; each gag would reflect how my brain was functioning on that day, and knowing my brain, I wouldn't wish that upon any readers. To answer the question, I'd say "It just looks like this. All the time." To answer the other question, I'd say "I change up the scenery. Often." I've had 7 studios in 7 years. For those of you playing at home, (and thank you for playing) you'd have incredibly deduced I've moved house every year since I left home. I also scrimp and save so I can take an overseas trip ever year- it doesn't have to be far flung location; places like Bali, Vanuatu or New Zealand are great as long as I'm taking in new surroundings, absorbing new cultures and expanding my visual vocabulary. It always does the trick. I write volumes every time I change scenes. Then I unpack. I used to work out of a tiny 2 x 3m bedroom in my mum's duplex in Greenwood, an old suburb in the sleepy northern suburbs of Perth. In the room was a bed, a chest of draws and a small desk for a computer. There was a small space for standing. In that room I slept, ate, watched TV and, most importantly, practiced drawing. My sister joked that I was the only person prison wouldn't phase. The polar opposite became the case, but I did learn to work in confined spaces. It came in handy when I had a deadline to meet while working on the edge of a shoebox-sized room with a mattress and a sink in France, or a train seat in Long Island. My mum's ex-boyfriend was the kind of bloke who would go around with a ute, picking up old furniture during roadside pick-up week in each suburb. He was a real estate agent and thrifty as they come, so he knew when each suburb was holding it's annual large garbage week, or as he poetically coined it, "Lar-Garb". One day he was rolling around the shimmering glamour of Winthrop, a suburb infamous for gun-crime and chalk outlines, when he came upon an old wooden drawing desk propped on the curb of a house made built in the bronze age. The old desk looked about 50 years old and needed work. He lugged it onto the back of his ute and snuck away before the neighbours could reload. On my 17th Birthday, (well it was months before, but he didn't know), he presented me with the drawing table, the surface of which he'd wiped clean with a hefty swab of methylated spirits. This might have explained some of the Steadman-esque drawings I did that summer. You can still give yourself restrictions. The human brain thrives on patterns, so if you set guidelines like allowing an hour between 10am and 11am every day for 'mind-wandering' you can still quite easily enjoy creative freedom without forcing it. If you're trying to come up with ideas and you're making a grunting sound, you're doing it wrong. Some people will tell you their best ideas come to them when their subconscious is occupied with mundane tasks; when they're in the shower, doing the dishes, watching Jersey Shore. That's not true for everyone, but there's something to be said for occupying that warden in your brain so your conscious mind-goblin can escape and do some exploring. Others will say they marinate on an idea, then go off and do something completely different then come back to it with fresh eyes. That's another good method. Others will say after agonising over an idea all day they 'sleep on it' and let their subconscious work it out for them. You'll find a lot of writers, musicians and cartoonists keep a pad and pen by the bed in case it happens mid-slumber. But as I said before my goblin wandered off, I've found the activity most conducive to creative inspiration is change. Luckily for me, time does that for you whether you like it or not. You can't keep everything the same no matter how hard you try so you're best off going with the flow and adapting to the change rather than fighting against it. Even if you don't want Breaking Bad to end. Moving house so often means I'm forced to audit my possessions annually, so I live with only what I need and nothing more. It makes packing easier, but it makes day-to-day living even more so. There's less distraction when you're trying to think- your mind isn't consumed by physical clutter. As a result, I don't tend to attach myself to material possessions the way I did when I was growing up. I don't own anything 'just in case I need it one day'. If I haven't used it in a year, it's gone. Craigslist is my homepage. If you're wondering, that old drawing board never made it past move number 1. It was so old the council got it heritage listed. I'm pretty sure the carpenter's name was J. Christ. My ex-housemate, Wyatt, who constantly (and hilariously) has the fervour of a drugged pet-store puppy, used to bounce around our apartment and laugh at how everything in our tiny apartment was messy chaos except my empty desk. Which was in the living room/dining room/entire apartment. He'd come home and say 'Hey do you know where the bread is? And DON'T SAY EBAY!' I'm still convinced that apartment was meant as a broom cupboard. But, despite its microscopic nature, I was accustomed to working and being creative in tiny spaces. It was new, interesting scenery and I stayed there for 12 months before clicking the 'next' button. One friend asked if I was too A.D.D. to stay in one place; that I was the epitome of the too-easily-bored Generation-Y archetype who couldn't sit still for more than five minutes without craving something new. I get that it seems that way, but it's more a case of 'keeping momentum to stimulate my little creative brain-elf'. I did have to delete Twitter from my phone to focus, so I'm not completely innocent of all charges. I still have creative blocks, I still hit brick walls and I still work close to deadline some days. But the more I do, the more I learn the best way to work around them. Everyone is different, so any self-help book telling you 'THE 5 GUARANTEED WAYS OF THINKING CREATIVELY' immediately take with a bag of rock salt. Everybody's different, thus, there's no one way to get ideas, or be creative, or let your brain wander. I hope to hell anything I've written here helps someone, otherwise wow. What a waste of time for you! Sorry. 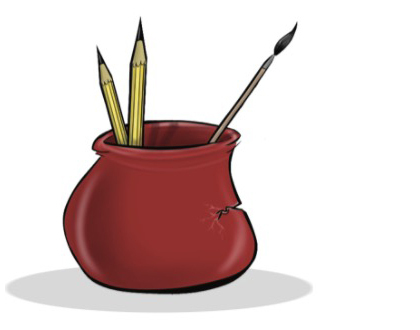 I can't believe I just wrote 1400 words on how to think creative as a distraction from writing a Sunday strip. The good news? I just got an idea for a Sunday strip.